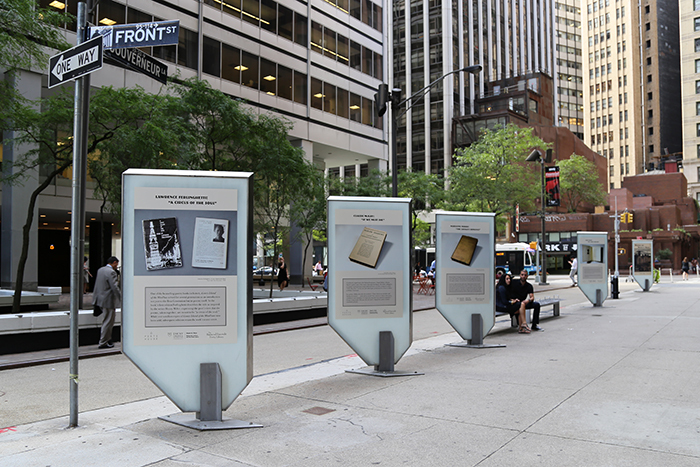 “Walking the Brooklyn Bridge: Poets on Brooklyn and Beyond” is a Manhattan sidewalk exhibit of upright panel cases featuring large photographs of rare and first-edition New York-themed books from Emory's Rose Library. Credits: Outdoor photos courtesy NYCDOT Flickr; panel images courtesy Emory Libraries. 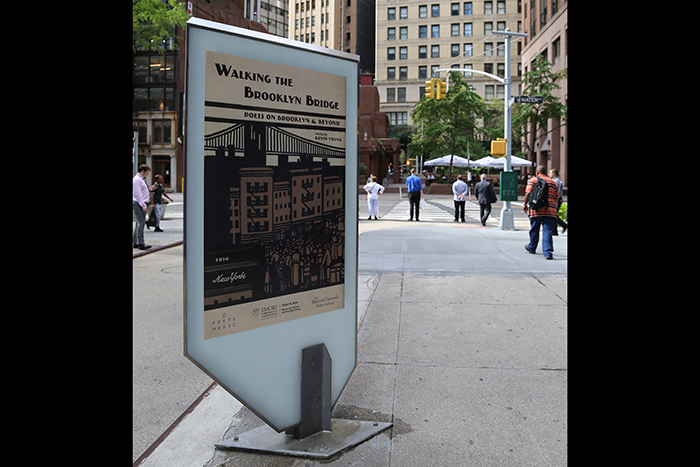 If you’re headed to New York City this holiday season, keep an eye out for a street-side exhibit that features images of Brooklyn Bridge-themed poetry books from the Rose Library’s Raymond Danowski Poetry Library. 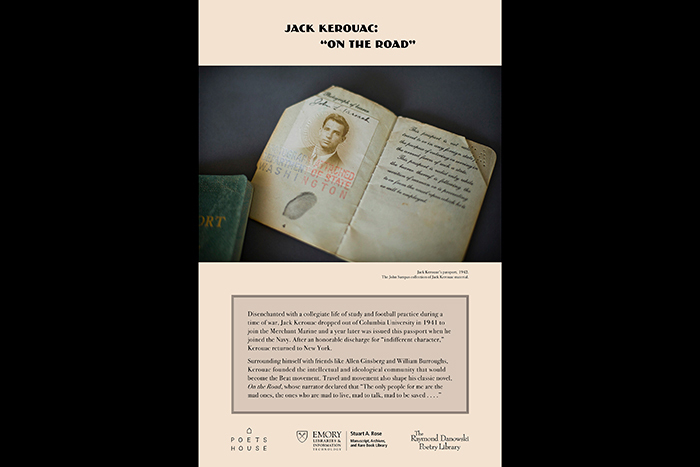 The photographs highlight rare materials from the exhibit “Walking the Brooklyn Bridge: Poets on Brooklyn and Beyond,” which ran at Poets House in Manhattan in 2015. It was curated by poet Kevin Young, who until recently was the Rose Library curator of literary collections and the Danowski Poetry Library. 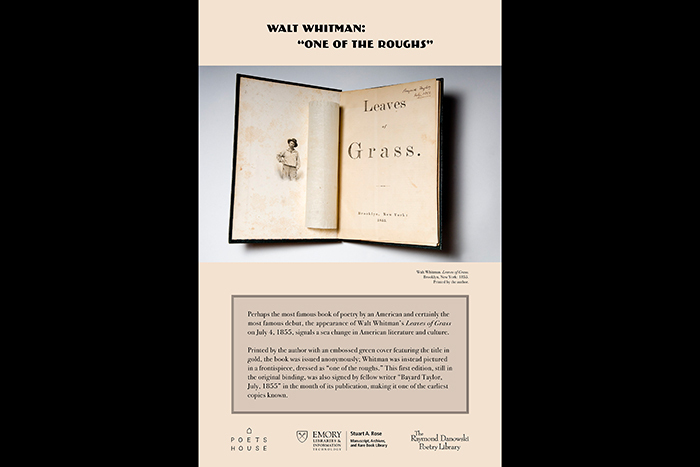 The materials photographed include rare and first editions such as Walt Whitman’s “Leaves of Grass,” Allen Ginsberg’s “Howl,” Hart Crane’s “The Bridge” (open to “Thy Cables Breathe”), Langston Hughes’ “The Weary Blues” and Claude McKay’s “Harlem Shadows.” The images were made into posters and then installed in 10 upright panel cases that were placed on Manhattan sidewalks along Gouverneur Lane between Water and Front streets, and along Water Street between Pine Street and Maiden Lane. This sidewalk exhibit, which opened in spring 2016 and will run through spring 2017, is part of the New York City DOT Art program to place temporary public art in city neighborhoods. It reflects the Rose Library’s mission to extend access to its collections beyond the Emory campus and the Atlanta community. If you will be in New York City, take your picture with one of the “Walking the Brooklyn Bridge” exhibit panels and tag the Emory Libraries on Instagram @Emorylibrary and on Twitter and Facebook @EmoryLibraries.